Hemodialysis access recirculation decreases the adequacy of dialysis delivery to the patient and is important to diagnose because inadequate dialysis can be associated with increased mortality. In some series, a high degree of access recirculation can reliably predict a hemodynamically significant stenosis. Causes of recirculation include decreased arterial inflow (arterial anastomosis stenosis), decreased venous outflow (venous stenosis), and technical issues such as improper needle placement. 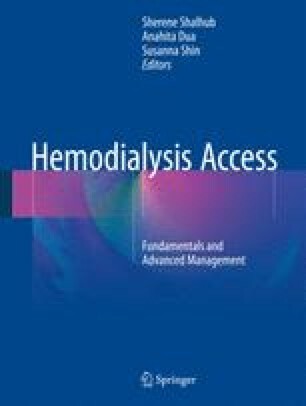 This chapter discusses the different aspects in understanding hemodialysis access recirculation and management of complications associated with the above.